Shades of Dennis Bergkamp prevailed as Arkadiusz Milik opened the scoring in Napoli’s 4-1 demolition of Roma on Sunday. The Polish forward has basked in the personal glory of a superb season already, and as his side cruised to a comprehensive victory at Stadio Olimpico, he took the vast bulk of headlines. Milik opened the scoring inside just two minutes. Simone Verdi clipped a pass over the top of Kostas Manolas and Federico Fazio, and before the defensive pairing of Roma could react, the ball had been thumped high into the back of Robin Olsen’s net. The 25-year-old striker ran slightly beyond the pass but hung his leg out to allow the ball to drop delicately onto the side of his boot before spinning and instinctively lashing a strike home on his deadly left foot. Milik’s 16th Serie A goal of the season sent social media into a frenzy, with comparisons to legendary former Arsenal striker Bergkamp manifesting as a result of the sheer genius of his first touch and finish. There appeared to have been an element of surprise regarding the striker’s deft control and powerfully-executed effort, but given his experience of working with the ex-Netherlands talisman, it is hardly a shock to see Milik take a leaf out of his former coach’s book. The pair worked together during their time at Ajax following the Poland international’s permanent switch from Bayer Leverkusen. 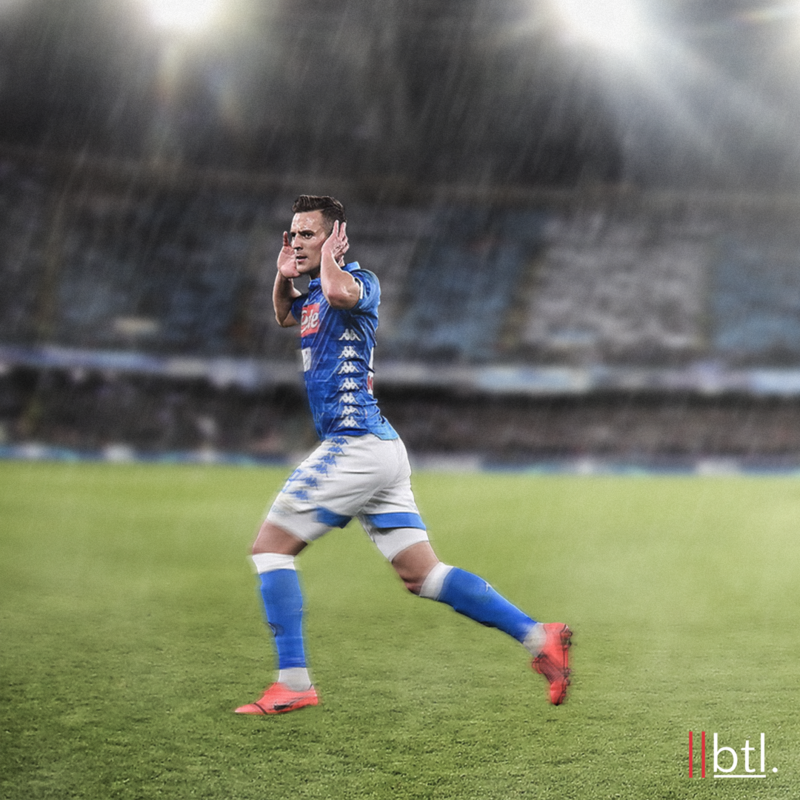 After impressing in his homeland but falling short of the mark from limited opportunities at Leverkusen and Augsburg in Germany, an escape route to the Dutch top flight emerged, and Milik has not looked back since. From 52 Eredivisie appearances spread over the two seasons he spent in Amsterdam, he scored on 32 occasions, also contributing with 12 assists as his ability to bring others into play improved. It was no coincidence that Milik’s upturn in development coincided with the time he spent on the training pitch with Bergkamp. Reflecting on his time at Ajax, the forward has often alluded to his relationship with the Dutchman. As quoted by the Evening Standard during Poland’s 2016 European Championship campaign, he said: “When I joined the club, we had a good relationship because I wanted to spend time after training working on my technique. We had good contact between us. Milik took the number nine shirt at Ajax in his second season and shone, prompting interest from all across Europe. He was signed in a €32 million deal by Napoli, making him the most expensive ever departure from Eredivisie, overtaking Wesley Sneijder following his €27 million move to Real Madrid from Ajax in 2007. It hasn’t been an easy path for the former Tottenham Hotspur trialist, though, who has been forced to battle hardships throughout his short career so far. His troubles began at an incredibly early age, and but for the guidance and mentoring of a young coach from Poland, he may well have led a far different life. Sławek Mogilan, affectionally known by Milik as ‘Moki’, is credited by the front-man as the catalyst for his unrelenting desire to improve, which has been ingrained in him since it was ensured that his potential did not go to waste. The once-troubled youngster grew up under the tutelage of the man who would go on to become his father figure, following the departure of Milik’s biological dad long before his rise to prominence. As he arrived at Napoli in the summer of 2016, expectations of the player were high, and there was a genuine sense of excitement to observe whether or not he could make the step up from leading the line for Ajax to successfully taking the place of Gonzalo Higuaín, who had departed for Juventus. Milik began life in Naples impressively; he scored three braces to help his side clinch vital wins at the start of the season; they defeated AC Milan 4-2 and Bologna 3-1 in Serie A, as well as Dynamo Kyiv 2-1 in the Champions League group stages. However, he was dealt a cruel blow and a significant setback during international duty with Poland. The forward had to come off in his national team’s 3-2 win over Denmark with a cruciate knee ligament injury. Having scored seven goals in his first nine Serie A matches, the long-term blow came at the worst possible time for Milik. He subsequently did not make another start in the 2016/17 season under Maurizio Sarri after returning in February, as Dries Mertens emerged as a revelation in a striking role. With a full pre-season under his belt, Milik had high hopes for the 2017/18 season as he aimed to lead Napoli to the Scudetto. He regularly featured for the team during the opening stages of the campaign, netting his first Serie A strike of the season in the 3-1 win over Hellas Verona, but a similar story of heartbreak would soon follow as the promising attacker had just found his feet again. During Napoli’s narrow 3-2 win over SPAL midway through September 2017, he suffered yet another cruciate ligament injury, casting doubt over his capability to play an influential role in the Italian giants’ season once more. Milik returned to action in March, missing a huge chunk of his second term at the club, but played a sporadic role as Juventus pipped his team to the title. He scored four goals in 12 appearances after his return from injury, with only two of these games being starts. The potential of Milik was clear for all to see, but there was an inescapable notion that he was merely an accident waiting to happen, and not a reliable goalscorer despite his evident promise and ability. However, as Carlo Ancelotti took the reins at Stadio San Paolo following Sarri’s switch to Chelsea during the summer, Milik has been reinvigorated, emerging as the ideal forward in the Italian manager’s system at the club. Expectations were hardly high given the 25-year-old’s failure to stay fit for a prolonged period, and the attacker had become rather a figure of misfortune following his injury woes. Even in June last year, there were concerns that Milik had once again fallen victim to a bizarre, unfortunate injury, as he slipped on a puddle while visiting a sea life centre with the Poland squad ahead of their World Cup 2018 campaign, hurting his hand, but thankfully not severely, in doing so. Milik just couldn’t seem to catch a break. However, fast forward to April, and he is Napoli’s talisman up front, having notched 16 goals for the team – without taking a single penalty – this season from 27 Serie A appearances. Ancelotti has identified him as a dependable option, and he is pivotal in linking play from the front, dropping deep to support central combinations, and also finding good positions in the area. Milik was renowned at Ajax for his ability to occupy dangerous spaces in front of goal, and he has displayed this quality of late, with five of his 16 Serie A strikes this term coming from inside the six-yard box. Intelligent enough to adapt to the demands of matches against teams with deeper blocks and more rigid shapes, he is a flexible player and scores a variety of goals. Although he has scored five at point-blank range, he has scored as many from outside of the 18-yard box for Napoli this season, too. Often accused of being too one-footed, Milik plays to his strengths and has put his best assets to good use. He reads the game intelligently, plays with conviction and enshrouds his deficiencies on his weaker right foot with thunderous left-footed strikes on goal. His reluctance to demonstrate his shortcomings on his right has been evidenced by the fact that he has taken only 13 shots on his weaker side this season. Nevertheless, he did score in this fashion as Napoli defeated Bologna 3-2 in December. “The sun is shining after a dark time,” Milik said to Sky Italia at the end of March. One could be forgiven for believing that the notion of placing personal performances ahead of the collective’s success would imply selfishness, but after all that Milik has endured regarding his injuries, it is a pleasure to see him in a confident, determined mood. He continued: “Having said that, Napoli have not yet seen Milik at 100 per cent. These difficult years left some damage, and I can do better. Despite his roaring success at Ajax, it could indeed be argued that Milik is playing the best, most tactically-impressive, and influential football of his career to date at Napoli, and if the best is still yet to come from the Polish striker, then I Partenopei can relish the prospect of what the future holds. Milik has without doubt been among the surprise packages of the season in Serie A, but while the likes of Krzysztof Piątek and Duván Zapata have rightfully claimed their fair share of plaudits, the Napoli star’s development has undeservedly gone under the radar. Despite finding the back of the net on 16 occasions this term, Milik’s xG ratio for the Serie A season is only 11.72, further highlighting his pleasantly surprising influence for the team during Ancelotti’s first campaign in Naples. Arkadiusz Milik is by no means the finished product. He still has plenty of room to grow, and his potential is not yet fulfilled. However, the future is bright for the 25-year-old, and as he continues to shine for Napoli, it seems his years of persistence are finally paying dividends.